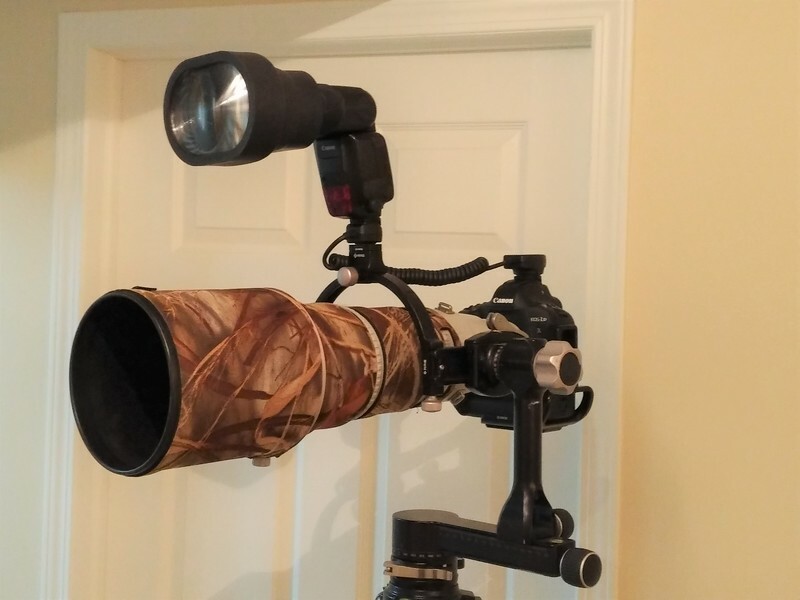 Question for you birders and flash users: Do you have experience with using a flash bracket with a telephoto lens, to bring the flash forward and higher? I'm told that it gives a better reflection in the eye. With on-camera flash, apparently you can get a "steel eye" effect (similar to red eye with people). Also, does anyone use a flash beamer with telephoto, to increase range? I'm booked on a bird photography trip and I'm using this as an excuse to try out some new toys (I mean, tools!). Thanks! I am not sure I would call myself a birder or a flash user. Most of the time it is just lens, body and myself shooting wildlife. Wimberly has what you are asking for. I have had it for years, not just for birding. It gets the flash up off the camera and over the lens. I attache it on the plate I have on the foot of the lens. They have several modular pieces and you can do many things with it. There are several variations offered. Also I have used this piece as a handle, its very sturdy. Also get the cord to go to the flash. I have a beamer, I know some here like it. I felt like it was a cheaply made gimmick piece. It works but for what I do it is to frail. To clarify. If you look at many pictures on the net it is mounted with tripod. I mount mine far forward on the lens plate, that way I can put it on the tripod or just carry it around hand held. I'll report back on how effective it is. First observation is that it is simple to setup and use, with the only downside being that the end droops down a little bit. So I have to tilt back the magnet mount on the flash a little bit to compensate. Anyone else use simlar setups? I'm curious to know your experience. Thanks! I'll report back on how effective it is. Please do. I bought the set up Rick recommended when I bought my 500. It is very nice. I have tried it maybe twice. My only potential contribution, and others may have a better answer or might find a fault, but I would try ETTL flash, which sends out a pre-flash, but then try it in M mode, which I believe does not send that pre-flash. But the point being, try something without the pre-flash. The times I tried it, I was in auto-ETTL mode on the flash and the birds were quick enough that they reacted. So, natural light, I have eyes wide open. ETTL with a better-beamer, I have squinted eyes or even some birds starting to take off. This is probably a noobie observation, but I literally have only tried this once or twice and haven't tried that theory out. My favorite flash bracket. You can configure it the way you want. Last edited by Jonathan Huyer; 12-15-2018 at 01:54 AM. I was in auto-ETTL mode on the flash and the birds were quick enough that they reacted. So, natural light, I have eyes wide open. ETTL with a better-beamer, I have squinted eyes or even some birds starting to take off. I had a similar experience taking flash photos of butterflies once. I would find a nice one with wings open and fire the shot, but the butterfly would react to the preflash and close the wings before the second flash fired! I was amazed at the reflexes. I think you are on the right track .... I have extensive experience with the Wimberly flash bracket that attaches to their gimbal AND the better beamer. I have also successfully employed ETTL settings but usually at reduced power such as in the range of -2 to -3 stops. I have had birds spook from the pre-flash but not all that often. You will need to experiment a little each outing by taking some shots and looking at the histogram but it is a very useful tool IMHO. In most cases I don't like the look of images with flash at full power. PS: make sure your flash is set to the correct "zoom" setting recommended by "beamer" manufacturer.